Some of the worst water quality problems result from nutrient leaching and runoff from agricultural lands. Nitrogen and phosphorus applied to cropland and not absorbed by crops in the process of photosynthesis will, one way or another, one day or another, end up in the water. The same goes for animal waste. The nutrients cause algae blooms, reduced concentrations of dissolved oxygen, and diminished fisheries and ecosystem health (called eutrophication). While there has been some effort to deal with these problems, I know of no great success stories, and water quality continues to decline in the Mississippi, the Gulf of Mexico, and the Chesapeake, the Great Lakes, and countless other water bodies. One obvious remedy would be to tax fertilizer. This would be a nearly Pigouvian solution. Better would be to tax runoff and leaching directly, but that’s basically impossible for practical reasons. The obvious but rarely stated problem is that it would probably require an extraordinarily large tax to have any real influence on the quantity of fertilizer used. And politically powerful farmers would cry foul, which is why this kind of tax will probably never happen. But I wonder: What would the incidence of a fertilizer tax, broadly applied, really be? Agriculture is fairly competitive. And demand for agricultural commodities is nearly vertical—about as inelastic as anything. The econ 101 analysis would suggest that burden of the tax would fall mainly on consumers. That is, food commodity prices would go up enough to compensate for most all of the tax. Now, I’ve seen some economists propose fertilizer taxes on a graduated scale. If fertilizer is applied at a sufficiently low rate, no tax would be levied, but the tax would then rise sharply with higher application levels (which is where most runoff and leaching comes from). This would be a little harder to monitor, but probably not too bad. If done this way, the total tax bill would cost farmers far less, but cause the same reduction in fertilizer use. And farmers would still get the full compensating price increase, since less output would be collectively produced. I think it’s possible—indeed, very probable—that the induced rise in commodity prices would more than compensate farmers for the fertilizer taxes they would have to pay under the graduated tax system. That is, a statutory tax on farmers could cause their profits to go up. Anyway, I don’t think anyone has made this point or emphasized it very well. And it’s an important one, at least politically speaking, because maybe farmers could get on board with a tax that actually benefits them. I’m not sure if it would save the Chesapeake Bay or Great Lakes from eutrophication, but I bet it would do a lot more good than anything else that’s been tried. Of course, there is no free lunch here: consumers would pay higher prices for food. Are yields becoming less or more sensitive to temperature? One of the hopes for adaptation is that farmers and breeders can somehow make crop yields less sensitive to temperature. Given that many agricultural areas have already seen significant amounts of warming, it’s fair to ask whether this is in fact happening. At the same time, it’s worth considering the possibility that things may be going in the opposite direction – that yields may in fact be getting more sensitive to weather. There’s a lot of history on this topic, which I’ll try to summarize briefly here before delving into some recent research summaries. Before history, though, it’s useful to keep in mind three distinctions. First, yield sensitivity is not the same as yield variability. The latter can change if weather variability changes, even if sensitivity to weather stays the same. Second, an increase in yield sensitivity (or, for that matter, variability) is not necessarily a bad thing from a farmer’s or even a consumer’s point of view. If increased variability comes as a cost of increased average productivity, then both producers and consumers may benefit from the newer, more variable yield levels. Third, this is potentially a VERY scale dependent question. Yield at a national scale, for example, can change for a lot of reasons apart from a change in yield variability for individual fields. For example, work by PeterHazell 30 years ago showed that changes in national yield variability were often driven by increased correlation of yields across different parts of the country. This could happen if production becomes more concentrated in a given geographic region, if practices or varieties become more uniform, or if weather becomes more correlated. There are lots of interesting questions related to sensitivity of aggregate yields to weather, some of which may be a topic for future posts. 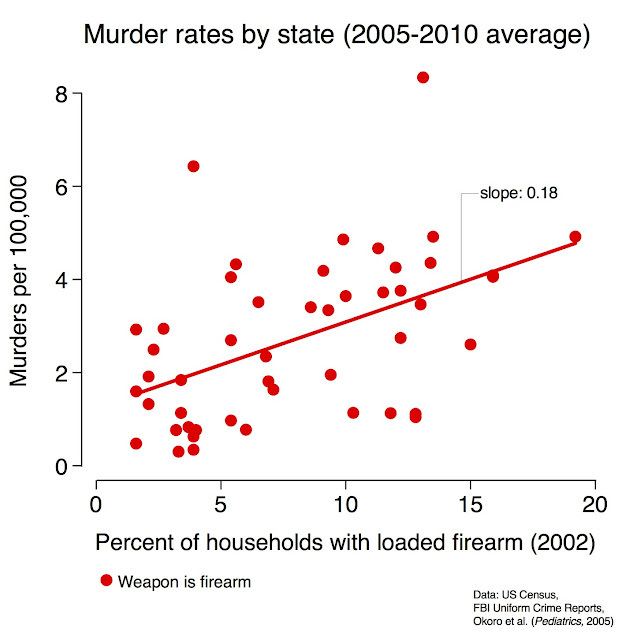 But here I want to focus on the evidence for yield sensitivity at the field level. In thinking about changes in sensitivity, it might be useful to lump things into two bins – things that we would expect to reduce sensitivity to temperature, and things we’d expect to increase it. In the first category are many agronomic changes, particularly a stable supply of irrigation water and pest and disease control measures. It’s also possible that varietal changes could reduce sensitivity, for example if they are more resistant to pest or disease damage (especially if these disease pressures are different from year to year), or if they are more “hardy”, by which breeders often mean the ability to handle extreme moisture or temperature conditions. One example of this would be the flood tolerant rice lines recently developed. Finally, there is increased atmospheric CO2, which one would expect to lower impacts of droughts by improving water use efficiency. In the other bin are things that increase sensitivity. Some agronomic changes could increase sensitivity, for example high fertilizer rates can allow crops to be more responsive to good weather conditions. Similarly, new varieties can be more responsive to good conditions. The “responsiveness” of varieties to water and nutrients is in fact one of the main reasons that current varieties are so high yielding on average. The net change in yield sensitivity of a cropping system is the result of all of these factors pushing in different directions. So which changes matter most in modern cropping systems? I recently came across a very nice volume from an IFPRI meeting held 25 years ago, which included several papers on the topic of yield variability (here’s a link, but beware of large file size). It seems many of their comments are just as relevant today as then. In particular, most of them emphasize the “responsiveness” issue – that well-fertilized modern hybrids are increasingly capable of taking advantage of good years. Especially in rainfed systems, this seems to dominate the other factors. Similar conclusions are made by other authors in the volume on tropical maize, temperate and tropical wheat, and other crops. 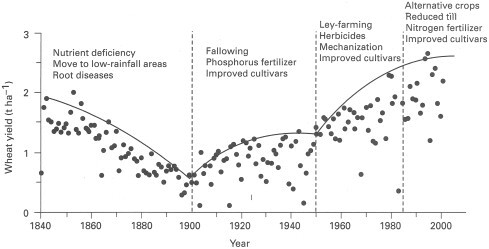 More recent work has made similar points, for example David Connor and others have written about how Australian wheat yields are now more variable than in previous generations, because farmers and cultivars are now so good at taking advantage of high rainfall years, but still face low yields in dry years because of insurmountable water constraints (compare 1920-1940 and 1980-2000 in figure below, taken from here. not shown here are the major recent droughts which would further show the remarkable amount of current variability in the system). Of course, in some cropping systems things can go the other direction. For example, a recent study of maize yields in France showed a decline in rainfall sensitivity associated with increased irrigation. 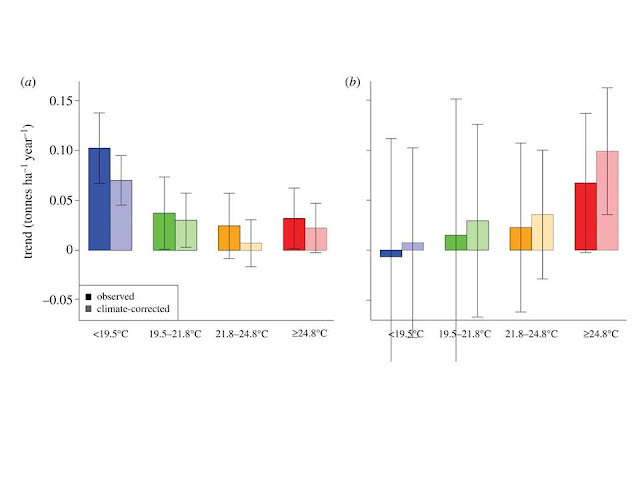 And another study at the grid-cell level for major maize and soybean regions found both areas of increases and decreases in temperature sensitivity. Although in that study, it seems plausible that a lot of the variation was due to noise, because cells of increasing sensitivity were often adjacent to cells with decreasing sensitivity. In a recent study, which was a collaboration with CIMMYT (the International maize and wheat improvement center), we attempted to look at how heat sensitivity has changed for one particular set of cropping systems that are of wide interest – irrigated spring wheat. To make a long story very short, we looked at two breeding nurseries run by CIMMYT, and evaluated yield changes for differing temperature conditions. In the main nursery aimed at producing “elite” varieties, there has been steady yield progress at cool temperatures but no significant progress at warmer temperatures (left panel in figure below shows yield trends for 4 bins defined by grain filling temperatures. “climate corrected” trends account for shifts in locations and weather within each temperature bin over time). This seems to be a similar story of cultivars becoming more responsive to good conditions (low temperatures in the case of wheat), with a resulting increase in the sensitivity to bad conditions (high temperatures). Again, this isn't necessarily a bad thing, but does suggest that wheat farmers are getting more not less sensitive to high temperatures. Interestingly, when looking at nurseries targeted at drought stress (right panel), the gains appear more evenly distributed and maybe even higher under worse conditions (albeit with more noise because of a smaller sample size). This is a reminder that it is possible to create more hardy plants. But those won’t necessarily be the ones that farmers choose to grow.